“As you browse through your family tree back a few generations you may see other auDNA testers show up (under DNA Connections) on those (WikiTree) profiles. If that other tester is a 2nd cousin or closer to you, then you WILL share auDNA with each other. If you do a one-to-one comparison in GEDmatch and you share no auDNA then there is a mistake in your (or their 😉 ) ancestry. 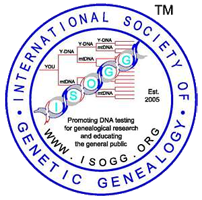 This is because all known relatives who are 2nd cousins or closer share a detectable about of autosomal DNA.” – Peter Roberts.